Coach's Corner - Bobby Orr GU Bruins skates w/"JSA" Mike Eruzione LOA. 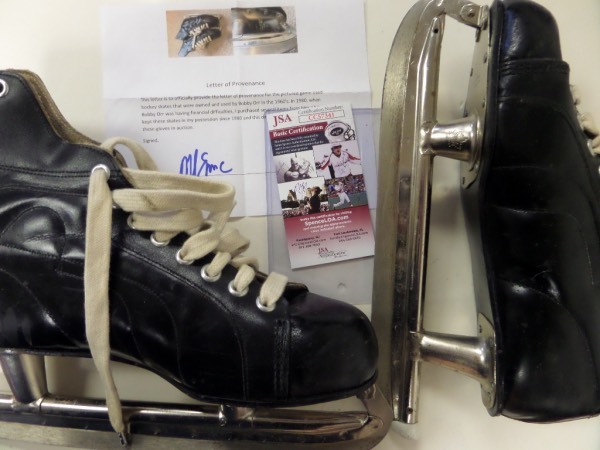 Go Back to Lot List Bobby Orr GU Bruins skates w/"JSA" Mike Eruzione LOA. This HOF display worthy pair of skates belonged to the NHL HOF great and show nice usage. The LOA from the 1980 Team USA star and Captain Mike Eruzione says that they are circa 1960's, and a JSA approved signature and letter accompany. Great item, certain provenance, and value is most likely mid-thousands on an impossible GU item from a true Beantown legend.